Habit: Perennial herb, sometimes rhizomed. Stem: 8--20 dm, robust; nodes visible. Leaf: sheath shredding with age; ligule 0.5--1 mm; blade 25--70 cm, 4--10 mm wide, flat or loosely rolled, hairy, +- rigid, prominently ribbed above, basal auricles +- clasping stem, +- hairy. Inflorescence: 15--35 cm; branches many, spreading. Spikelet: 8--16 mm; lower glume 3--6 mm, upper 4--9 mm; florets 3--8; lemma 6--12 mm, generally minutely hairy, scabrous near tip, often tinged purple, awn 0.5--4 mm or 0; anthers 3--4 mm; ovary tip glabrous. Chromosomes: 2n=28,42,56,63,70. Ecology: Disturbed places; Elevation: < 2700 (generally < 1000) m. Bioregional Distribution: CA-FP, W&I; Distribution Outside California: to eastern North America; native to Eurasia. Flowering Time: May--Jun Note: Used for forage and soil stabilization. Often infected with a fungus that is toxic to cattle. Synonyms: Schedonorus arundinaceus (Schreb.) Dumort. 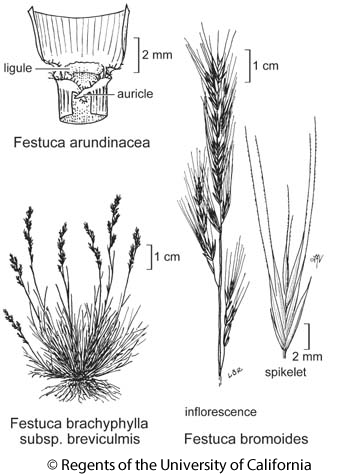 Citation for this treatment: James P. Smith, Jr. & Susan G. Aiken 2012, Festuca arundinacea, in Jepson Flora Project (eds.) Jepson eFlora, http://ucjeps.berkeley.edu/eflora/eflora_display.php?tid=25783, accessed on April 19, 2019. CA-FP, W&I; Markers link to CCH specimen records. Yellow markers indicate records that may provide evidence for eFlora range revision or may have georeferencing or identification issues. Purple markers indicate specimens collected from a garden, greenhouse, or other non-wild location.